It's Christmas Eve and time to enjoy some the holidays with friends, families, and, of course, guild mates. 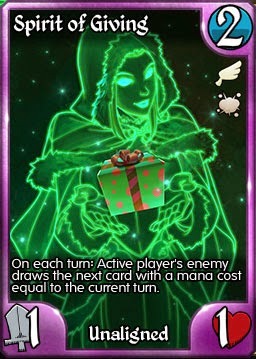 Don't forget to play Kingdoms CCG tomorrow to receive your FREE copy of our new Holiday card Spirit of Giving. Just log in any time from 12:01 am EST to 11:59 pm EST (aka New York time) and the card will be added to your account. Note that just like with Firstborn of Euna, if it doesn't appear immediately, just log out and back in again and the card will be there. Cards with this ability will be unaffected by Destroy Effects - Realm Crusher, Divine Wrath, Tribute to the Gods, Echo Blast... none of these cards can destroy this creature. It won't stop damage of any sort though. 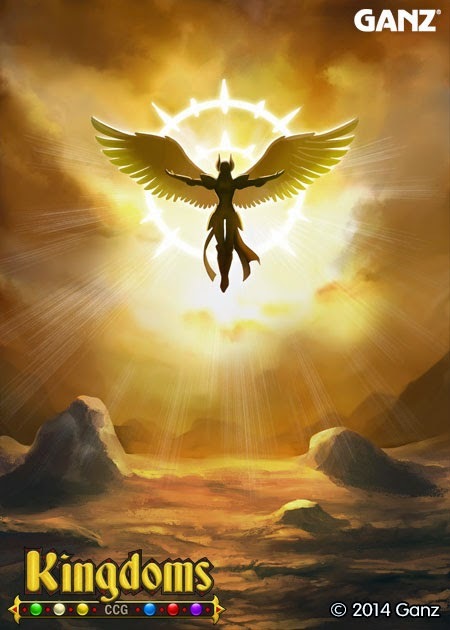 How many cards will have this icon in Light Ascending? Well... none. But it may just appear on a buff to one of our existing Heroes, and of course you can pull out those Engine Oils and get lucky! Here are three cards with powerful effects that should find their place in the new metagame, and have amazing art to match. And yes, we're reading your comments on these cards. We've seen the feedback on our first preview card and will be making adjustments to tone down its power. Wait what? Yes, in our two recent podcasts we eluded to working on a set of six new heroes. This is true and they will be coming in either Q1 or Q2 of 2015. 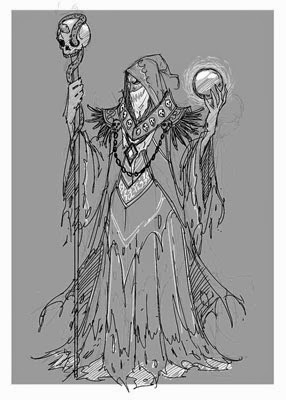 Here is the very first look at a sketch of one of these heroes. We received this today and just had to share it. So have fun, enjoy the holidays and get some good battles in! Update... and a New Card! We've been working away at programming and testing the new cards in Light Ascending and the set is coming along nicely. As it's SO hard to keep these cards under wraps, we've got our first preview card today! But first, we're also looking at ways to improve the game as a whole. One of the areas that we have singled out as needing improvement is Crafting. Note: if you we're planning on scrapping a Rare card for essence... don't. Today, if you scrap a Rare there is a chance that you will only get a Crafting Stone, and as you need way more essence than stones, that's just terrible. With our next release we are eliminating the chance to only get a stone when scrapping. You will still be able to get a stone with your Uncommons and Rares, but you'll always get essence as well. We're currently testing some other changes to crafting as well, but we'll tell you more about that in the new year. In every new set, we look for those never-before seen abilities that have the potential to turn the game on its head. For our first preview card we have an amazing new Relic with card text that dramatically changes the battlefield when it is your turn. "Enemy creatures do not have abilities" No Resist. No Armor. No Manacycle. No Reassemble... 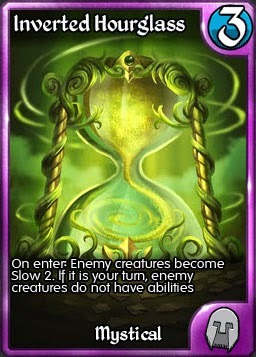 Combat on your turn will be completely different with the Hourglass in play. And the On enter trigger cannot be overlooked either. It holds back an aggressive team for two turns as you set up the perfect response. Expect the game to get turned upside down when the Inverted Hourglass arrives in January! 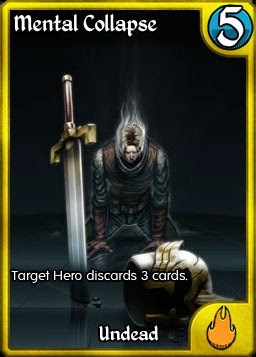 * Card is currently in testing and is still subject to change. We've just posted 8 all-new art previews on our official Facebook page. We'll be posting more images through December and early January, along with actual card shots as they get through testing. Our challenge to you - guess the card names and abilities! Post your guesses in the photo's comments. Our latest update is now live! Log in any time between today and January 1 to get your FREE copy of Firstborn of Euna. And as a special surprise, we have a second free card for you! Login on Christmas Day 2014 and you will receive a copy of our brand, new Holiday promo - Spirit of Giving! Yes, on each player's turn, their enemy will draw a card with cost equal to the current turn (psst - since you played it, the first trigger will be your enemy giving YOU a card). If you can't wait until Christmas, or want more copies, she's available now in the Holiday singles shop. Firstborn of Euna added to the game. 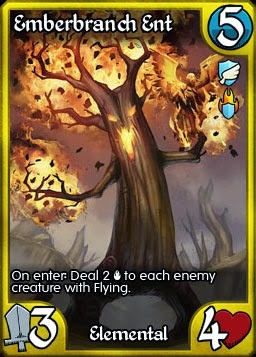 NOTE: Invoked has been replaced by Burn on this card. Login Award system added. Firstborn will be awarded one per account using this system*. DO NOT SCRAP THIS CARD. You cannot get a second copy at this time. Spirit of Giving added to the Holidays singles shop. Login Award set up for Dec. 25 to give out one copy of Spirit of Giving per account. Ho ho ho. Tribes 2 is back in the singles shop. Nomad's "Steal Card" had its lame name changed to "Acquire" and has been given new art. Nomad's 7th Star is now working properly. Nomad's Grand Theft ability text has been made more clear. Deny has had its length returned back to 5 as it was prior to the last push. All of the Concealed Dagger triggers are working properly again. The Opuses have been fixed. Reconstruct can now only return gear up to mana cost of 5. Empower can now only remove up to 4 abilities. See below for an explanation. Aegis Shield can now prevent up to 5 damage before it is destroyed. Myriad of Dryads' cost has been reduced from 7 to 6. 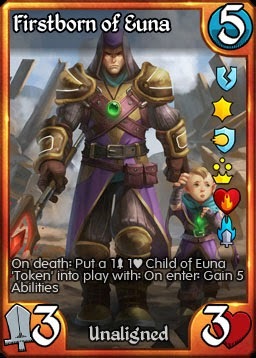 About Empower: With the release of Firstborn of Euna, and knowing that the next set contains a good number of cards that give abilities, we have decided to make a pre-emptive limitation on the card. This card should have had a limit on it from day one, but as creatures in Eve rarely had more than 2 abilities, we're sure it didn't seem like a problem at the time. Also note that with the ability to grant +4/+4 for just 2 mana, it is still the most powerful buff spell in the game. A 7/7 with 2 abilities is nothing to laugh at. 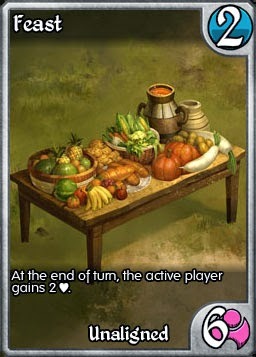 * New accounts will not receive this card during their first play. They will need to log out and back in again to receive the promo. 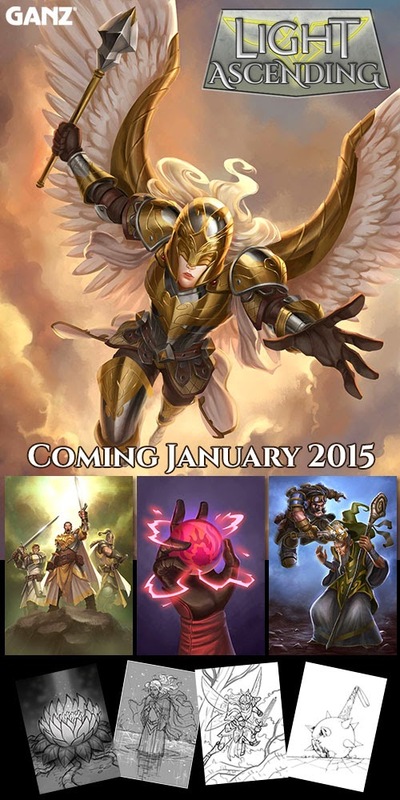 On Dec. 11 we will be releasing our next update to Kingdoms CCG. We'll save the complete release notes until that day, but we wanted to let you that the release will include the release of Firstborn of Euna. How do you get your FREE copy of this powerful Legend? That's right. Play any time between December 11 and January 1, and upon logging in you will receive your copy of Firstborn (one card awarded per account). Her abilities are random so there are over a million different combinations. So again, thank you from the team here at Ganz for sticking with Kingdoms CCG throughout 2014. And be here this Thursday for another special announcement to make your holiday season a little more... Giving. Battered down the Dark Alliance, the Kingdoms of the Light retreated, their armies exhausted. Just as all seemed lost, a new champion emerges - an angel of unmatched strength and ferocity. Now it is time for the Light to shine! Raise the guard, for the Light shall ascend! Light Ascending is a 55-card set, spotlighting the power of the Light alliance. 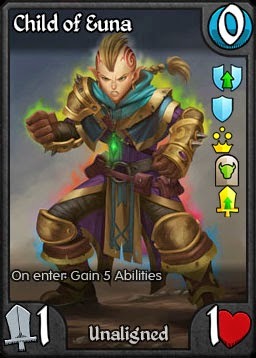 Watch the Blog for card previews and join the discussion in the forums!